Millions of people across the UK wear oral appliances such as clear orthodontic aligners, a night guard or dentures all of which serve a very important function. These can be a significant investment in the person’s health, appearance and well-being, therefore protecting this investment by taking proper care of it is imperative. It also ensures the appliance works to its maximum potential and prolongs the lifespan. Wearing an unhygienic dental appliance can lead to unsightly and costly oral disease, therefore good oral hygiene standards are of equal importance. 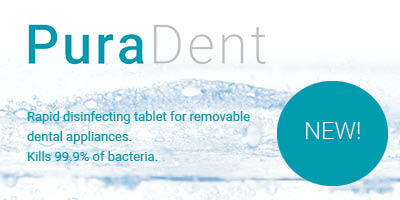 PuraDent rapid disinfecting tablets are suitable for the cleaning of removable dental appliances, killing 99.9% of bacteria. The non-corrosive hard working formula fights against microorganisms such as Candida albicans, Pseudomonas aeruginosa and Staphylococcus aureus. Using 1 tablet, twice a week helps to keep your dental appliance clean and bacteria free. The tablet can be used safely on all types of removable dental appliance without the fear of discolouring or altering the materials of the dental appliance, including the metallic parts.